I'm busy you see, busy having a 'spring fling'. I'm soaking up the sun, cool breezes and all their glory. Your saying, "Isn't it always sunny & lovely in Houston?" I'd ordinarily say, "ya'all are right" (I can use the accent now that I'm a Texan resident). Our winter, much like the rest of our United States of America, weather was such that only a clairvoyant would of predicted. Don't get me wrong, I adored breaking out my neglected cashmere and wool but happy once again to bid them ado. Whilst I should be in the kitchen preparing a meal, planning Easter brunch or my husband's birthday dinner, I dream a little dream of staying out of the kitchen. Instead of the traditonal baked ham, how about letting each one of my guests pick out their favorite box of breakfast cereal in lieu of time spent indoors, in the kitchen? A big bowl of Captain Crunch with crunchberries is rather festive in it's own way, colorful. So, with the birds now chirping, the skies a bright, brilliant, almost shimmery blue along with temp's back into the glorious 70's, I long to take it all in. For you see Scotland is still on the agenda and those days of lounging by the our grand pool will be only a faint dream. ** I've included a recipe that for at least one evening grants you a reprieve from hours in front of the cooktop. Put it on and forget about it. Incredibly easy & so very tasty. Do hope you'll enjoy. Cheers! Let me know if you like the recipe! You, my dear, are divine. 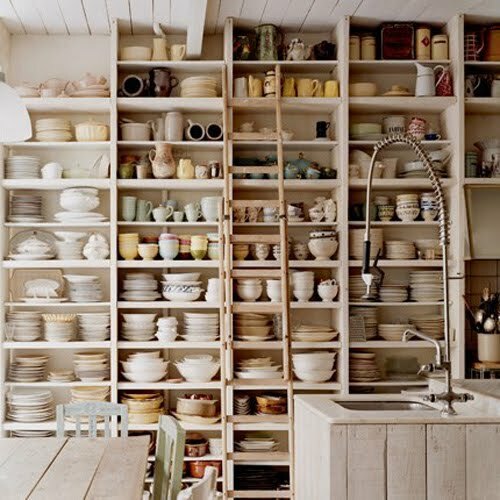 Lovely kitchen eye candy and a no-brainer dish. Do we love you, or what...? Coming from you I know it's a winner!! 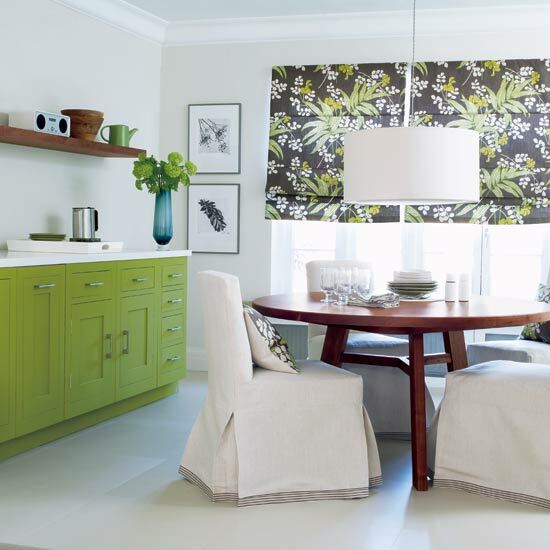 love the green cabinet kitchen!! morning coffee would linger into afternoon tea into evening cocktails in those chairs. i've had secret fantasies of curtis popping up at my grocery cart, eschewing my yawn yogurt in exchange for some fabulous meal at home using woks, shun knives, and his dimples. cereal party!!! i'm there with my Kix!! Katie tested, mother approved! woo hoo! The kitchen for darling Curtis would have a bed in it. Oddly, my teenage daughter (at the time) turned me on to Curtis. Maybe not so odd... after all, the apple doesn't fall far from the tree, right? 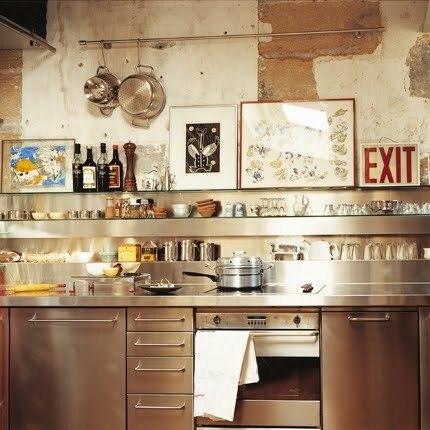 What a wonderful kitchen tour. When I see a series of images of a specific room, I'm always amazed at how many different and creative ways people take the same basic furnishings and arrange and decorate to make each room totally unique...all interesting. Must say those stacks of china are a BIG turn on! Great images!! The recipe sounds delish! I will definitely try this out!! Fab kitchens! 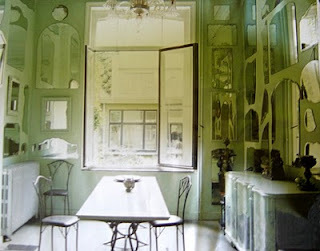 Oh, I'm in love with that pale green kitchen. The hubs and I have cracked up SO many times over how the ladies have to go "freshen up" when they get back to their house after he ambushes them at the grocery store. Too funny! First of all, I love the idea of giving the Easter guests a bowl full of cereal !! That's my kind of cooking on a sunny day, although I will attempt the Beef Strogonoff. Actually, I'm quite a good cook so, I don't know why I said that !! I love all of the kitchens that you have shown, Deb. 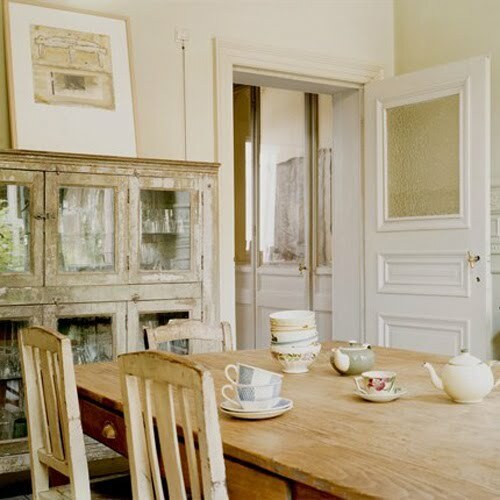 So much more welcoming than those massive, impersonal, cold, minimalist ones where I'm sure nobody ever cooks and cost a fortune ! How lovely that you are having such glorious weather. Ours has turned cold again and Scotland is having LOADS of snow . I'll have to rethink my wardrobe when we go !! Wish Graham a very happy birthday and I hope he has the BEST day. After the time you've had lately, I am prescribing lots of good food, copious amounts of alcohol and lots of dancing !!!! 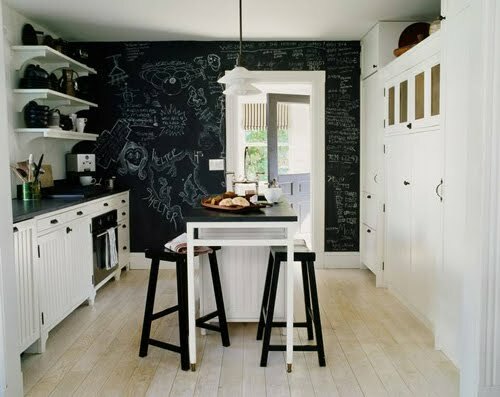 Loving those kitchen interiors! Thanks for the recipe... I"ll try it out when I'm craving something hearty again. Curtis is a great guy... have you seen him in the new Celebrity Apprentice? Not a huge fan of Ramsay unfortunately. I think his TV persona is a little too contrived (he never swore like that before) and the quality of the courses in his restaurants has dropped so much I'm not surprised he's had Michelin stars taken away. His proteges Angela Hartnett and Jason Atherton are still fantastic though! I like the idea of the breakfast cereal dinner party, and of course it'll be good practice for all the porridge traditionally eaten in Scotland. Daaaaaaahling great news!!!!!!! 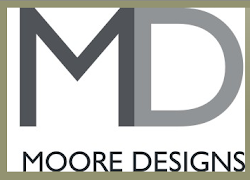 You've won my competition for $75 worth of Amazon vouchers Woo HOO *kisses* please contact me with your email address so I can send u an e-voucher. As to this post, I love all these kitchens. 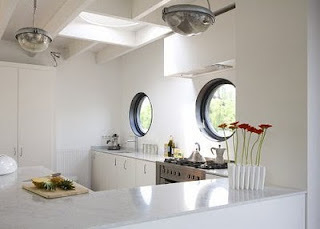 I've always liked the look of steel kitchens, but I decided on an all white kitchen and it has a white corian top. It looks way cool and is a pleasure to work in :D (if i worked LOL). 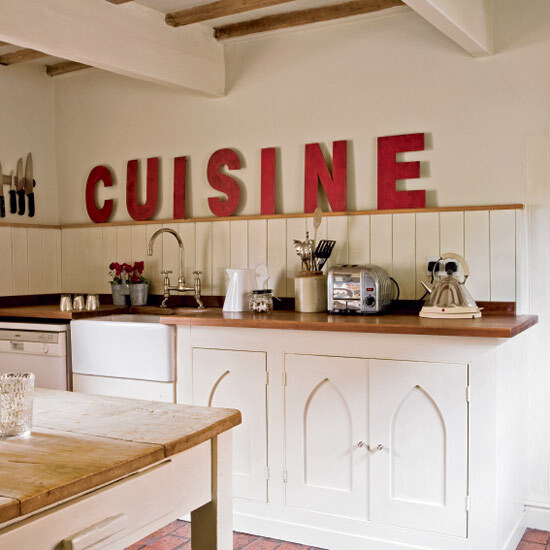 Curtis is gorgeous and such a good cook...I'd cook with him in ANY of these kitchens! The one with the picnic table and the pink cushions is calling my name! Hope you have a great rest of your week! You are NOT kidding. you saved the best image for last. oy! I'm certain then that you have been watching this lovely boy on Celebrity Apprentice? If he's not cute enough to look at, hearing him talk is even better. AND he cooks! wow! 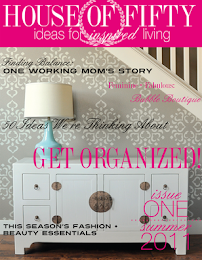 Lucky you....winning HH's Amazon gift certificate! And yes, he is a hunk and a half. And I don't want to brag but I have a nephew in California who looks just like him! The Kitchen Witch calls recipes like this one (goodies that are from the 60's) "white trash motherlode". Which is a compliment! I'm going to post one with veal, coming soon, that is very similar to your stroganoff. Defininetly white trash food! I redid my kitchen about 4 years ago...very stainless steel and comtemporary when I have a traditional, if islandy, house. 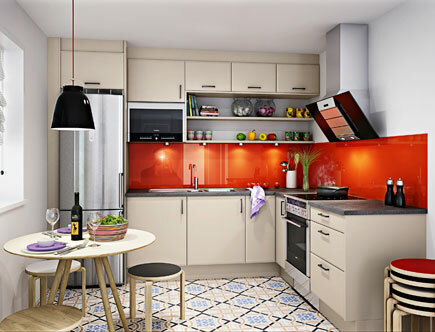 I am NOT NOT NOT going to be tempted by these lovely kitchens, esp. kitchen #6.....which MUST be in France. Tell me it is! And yes, Deb, let them eat cereal! Enjoy the gorgeous weather, Deb. I had lunch outside today and I'm longing to get out of the office this afternoon and enjoy some more of our perfect weather. I think you've got the right idea, Deb! Throw is some Frosted Flakes and I'm there! 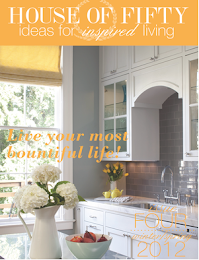 This is a FANTASTIC roundup of kitchens. There are so many gorgeous ones here, I could never choose just one. Glad you're getting some good weather out your way. We are too - finally! I haven't had Beef strogonoff in quite some time, I will have to try your recipe, merci!I love a good kitchen, and they all look dreamy to me...Spring is the best, isn't it! 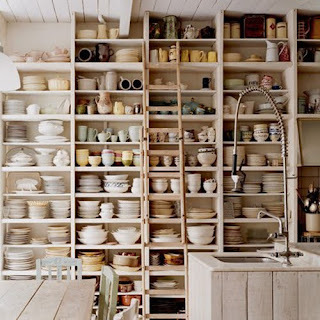 Love all these kitchens, especially the yellow chairs/chinoiserie, adn the one from MarieClaire that just has all those incredible shelves!! The recipe looks easy and tasty, but as a vegetarian, I won't be trying in :(..
Sooo this Curtis is kind of easy on the eyes, no? Hi Deb, congrats on winning HH's giveaway! 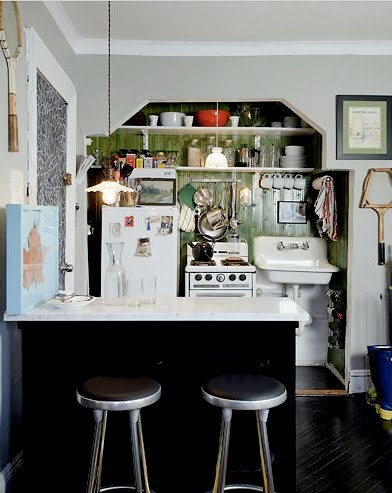 Love all the kitchens in this post, they are all filled with fabulous and unique style! As to the Chef Ramsey--does this mean you want someone to swear at you? Or that you like his "cooking." I adore the picnic table kitchen, but my back hurts when I think about sitting on those benches for extended periods. Which we'd be doing, Curtis and me, with our martinis and foodie foods. I meant "it was amazing," but I was, too. Riding around on my bike like a young woman. Such sugary eye candy and the kitchemns are not too bad either. Oh the only kitchen for Curtis is mine....preferably brekafast thank you. Deb- Good for you out enjoying the gorgeous weather. We're drying up today after getting soaked for the last long while. I'm going to sit out back and enjoy the sun and my favorite stray kitties (who I guess are technically our cats as they live in our backyard and we feed them daily). I love a simple recipe. Sometimes you just don't have the gumption to get gourmet. Actually that's most of the time. Lastly, thanks for all the inspirational kitchen photos. What eye candy! 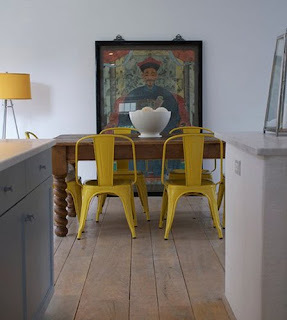 Love the Chinoiserie one with the Chinese ancestor portrait and yellow chairs-brilliant! 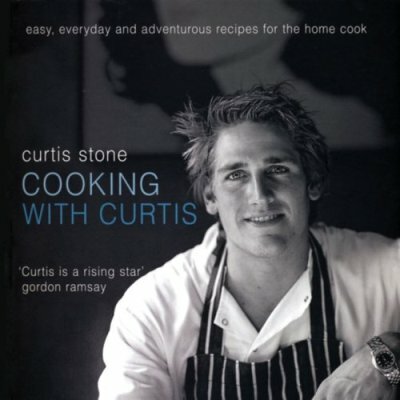 What a handsome guy, Curtis Stone. 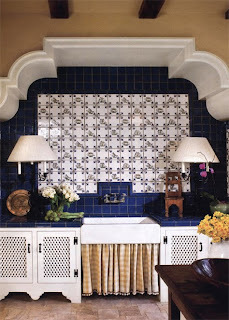 Love all these chic kitchens! Deb: how marvelous to hear from you! Yes, I think it's weird you like the smell of vinegar. I add a little essential oil to my spray bottle when I use it; when I gave Hubbs the Heisman (thanks Jenni from My favorite and my best for that euphemism), I got rid of all the douchiness around here, so....yeah. I mix in a little lavender oil to freshen it up. Gotta be careful with that, though. The oils can oxidize and stain. XO your Kitty! Definitely enjoy the spring weather! Long time coming! Had to laugh at the recipe as it's strikingly similar to one my mom and grandmother handed down to me. 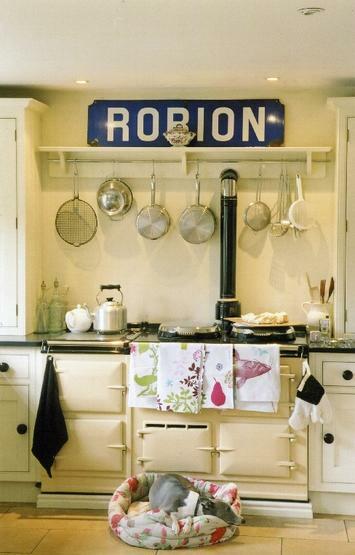 And as for kitchens, while all are lovely, I'll take the Robion sign one!! Enjoy all that Spring sunshine. Love all the kitchens here, lots of unique style. This is so funny, believe it or not I was looking for a good Stoganoff recipe this week! Will definitely try this, yes easy peasy is so good! Scotland will be a big chnage from Texas, but no worries, change can be very good!! Just love all your images, always such a pleasure to visit with you! I think you have inspired me to try and stay out of the kitchen this weekend and enjoy the lovely weather we all seem to be having! You are very lucky! :-)It is still somewhat cool in New York and I can not wait for the sun to shoew up! 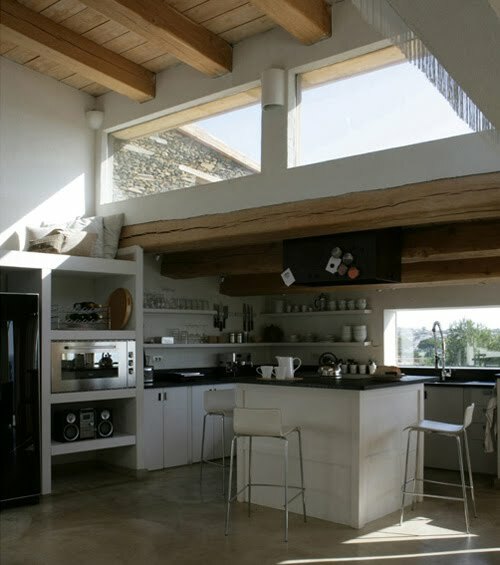 What a fabulous collection of kitchens! 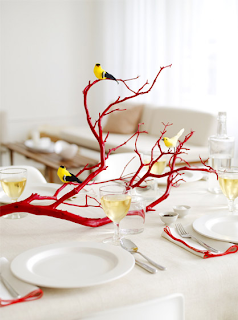 I love that striking yet simple table setting and centerpiece in the first pic. And I like your idea of various cereals for an Easter Meal. Why not? If I had to choose between spending hours upon hours preparing food and enjoying the weather outside, I'd choose outside any time! One of my all time faves is a big bowl of good Muesli for dinner - oh bliss!! Curtis is a hunk, no doubt about it. His recipe for Roast Duck with Rosti in the Cooking With Curtis book is beyond divine. I can picture you in a tweed suit & brogues wandering the Scottish moors, tweaking the accent until you get it just right! 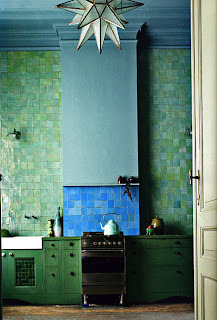 i think the green tile run straight up the wall is fab. It is no surprise you are on everyone's favorite's list. 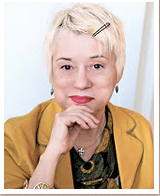 Your blog is divine, an escape into a world of fun and beauty. I remember Bonwit Teller. I loved it. I wonder what went wrong. Now I shall join your fan club. Love all your choices .. . each one has a unique flavour and personal expression. Though I must say I'm liking those yellow chairs in front of the giant portrait. I've just broken my chef (aka husband) of a very bad Campbell Soup habit - so, I'll decline the recipe (but know he'd adore it) ! 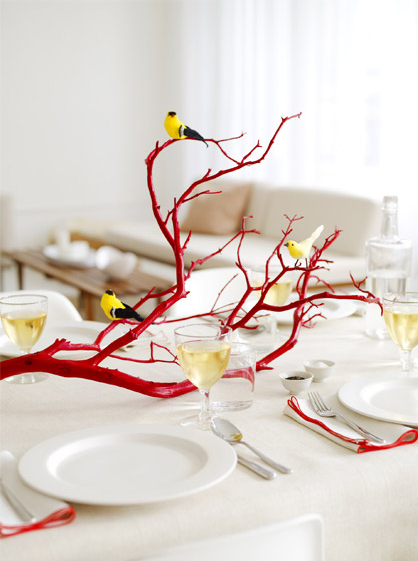 Love that table center piece w/the birds. Great collection of pics - the kitchen w/the blue tiles is beautiful.